Synopsis: Whatever you’ve heard about Caraval, it doesn’t compare to the reality. It’s more than just a game or a performance. It’s the closest you’ll ever find to magic in this world . . .
Review: Unless you have been living under a rock, you have heard about Caraval. Caraval is one of mostly highly anticipated releases of 2017 from debut author Stephanie Garber, and if I had to put it in most simplistic of terms – it is absolutely stunning! That’s right people, believe the hype. Believe the magic that is Caraval! I will admit, whilst I was excited to get my hands on this book, I was a little nervous going into it. Firstly there was all the hype (which sometimes builds up too much expectation) and secondly, as a debut author I did not know Stephanie’s writing style. So ever so excitedly but still reservedly I opened the book and read the first chapter. Letters… okay, still reserving judgment. Then came chapter 2. The first small paragraph, filled with magnificent descriptions of colour. I was already hooked! I will freely admit that I was hooked after the first chapter of prose. I decided then and there that this is an author that knew how to write, and I feared that I would fall in love. And fall in love I did. Wow. This book is exactly what I wanted and needed. It is filled with luscious and vivid descriptions that sweep you into this magical and sometime frightful world. 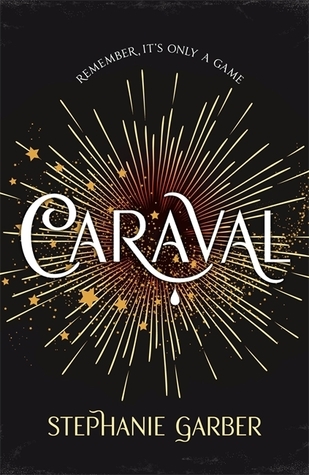 Caraval follows Scarlett, and her lifelong dream has been to participate in the enticing and lucrative game of Caraval. Scarlett and her sister Tella need to escape their cruel father, but she cannot dare dream of doing so, as that is about as far away as having her wish grated of receiving an invitation to the no longer running Caraval. Until events take a few mysterious turns and Scarlett indeed finds herself where she has always dreamed. However, her dreams may soon turn to nightmares. Along with the risk of going crazy inside the game, Scarlett needs complete the game – as the games legendary mastermind has kidnapped her sister Tella, and the only way to get her back is by winning this dangerous and complicated game. This enchanting story mixed with the absolutely stunning prose completely had me under its spell! With a dreamlike setting but with such vivid storytelling, this is a book that you can get completely lost in. Everything your heart desires resides in Caraval, and all the dangers that go along with it. The pacing is perfect for both the story arc and the reader’s journey. The mystic setting of Caraval is glorious as are the dangers that it withholds. The imagery is superb, the world-building is mesmerising – overall, this book is just spellbinding. Filled with deception and trickery, magic and wonder, complexities and simplicities, ths book is a luscious blend of enchanting and darkness. Magical but yet heartfelt. The game itself was very well thought out, with the mix of joy and terror at every turn. But I also loved the characters. With Scarlett being the focus of the story, but her sole focus was getting her sister back safe from the clutches of the games master, Legend. Her only ally is a dubious sailor Julian, who is surrounded in just as much mystery as Caraval itself! Scarlett was an interesting mix of naïve and fierce, Julian continually kept you guessing with his combination of secretiveness and sweetness, and Legend, well he is a true ringmaster of mischievous and brilliance, he is both entertaining and deadly. The story unravels beautifully, with details being revealed and twists occurring at just the right moment. You will be kept on the edge of your seat as you get swept away in this exquisite world. You will be entertained, you will be dubious, you will shocked and you will be captivated. What I enjoyed most was the risk of getting so lost in the magic of Caraval that you could willingly lose yourself – and this stands for both the characters and the reader. But the risk for the reader is only when the book ends… it will leave you wanting more of this breath-taking world! Caraval is beautiful and twisted, exciting and dangerous, sweet and vicious. With a beautiful and lyrical prose, delicious world-building and an exceptionally intricate storyline, Caraval is an outstanding debut! Welcome to Caraval – where mystery and wonders await.